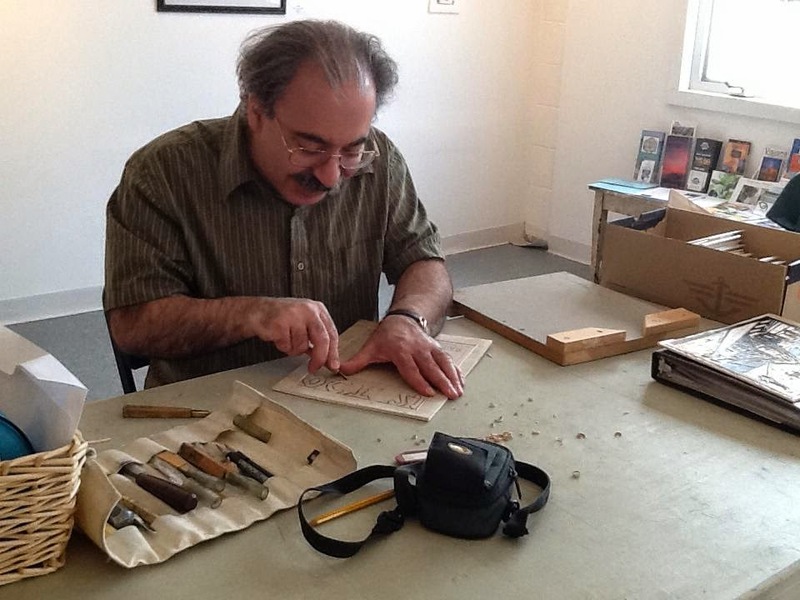 Today was the latest Belmar Art Walk, and I agreed to do something at the Boatworks. Ideally I would have a block drawn and ready to cut, but I haven't got quite that far on my latest. Been a busy few weeks, and I've been in Belmar more days than not, between the mural and the train show. Last week I met with my brother and his wife, and we selected which James would be subject for the print. We're going with Bd James Strepar, a 15th century archbishop of Polish descent who lived in a region of Eastern Europe that has been claimed by a number of empires in the centuries since then, and straddles a few current nations. James was put in charge of this region and worked hard to settle disputes and unify some of the church factions in conflict. One thing that I noted in my original notes is that he spent a lot of time traveling this Galicia region, often on foot, establishing churches in some largely unexplored areas. My brother's wife's family includes a portion that comes from that part of the world, which makes this his son's ancestry as well. I liked the fact that he was a hiker, and I could see using related objects in the image. In my mind I've been working out ways to include such things, but I haven't had a chance to finalize it on paper yet, though at least I had prepared the wood surface. However, the deadline was today, so I went with what I could commit to- the feast day of October 21, and the name. I was stationed in the gallery of the Boatworks for about three hours, and my duties included greeting, answering questions, promoting the print raffle (brought in another $20 or so) in addition to demonstrating my process. Various people who saw me from the other side of the table took photos, and this one from Rebecca at the BAC is the best one I saw. So between all that, and that my tools seem like they could use some sharpening, I didn't get very far- just outlining the border, including the date at the top. In the near future I hope to resolve my story image and get it on the block, and then get some real cutting done. Spent a lot of time at the Boatworks today, the day of all our railroad events. My first few hours there was not specific to the train show, but just subbing as a gallery sitter during our standard open hours. Today was a preview for the annual Belmar Art Walk, so I was able to give out information, and advise people about some of the exhibitors. After that, we had a guest speaker arranged by the Belmar historical society, talking about the history of trains in Belmar, and in New Jersey in general. It actually turned out to be quite interesting, and I wouldn't have minded it continuing, but we had to call time so all those in attendance could make it over the train station in time to see the dedication ceremony. I wouldn't have minded seeing that either, but as the gallery sitter I had to stay behind and keep the gallery open. Any thoughts of locking up and dashing over there were halted because we still had visitors arriving due to the Art Walk preview day. So I used the time to put away the extra folding chairs (needed all of them for the talk) and set up extra tables to hold all the donated food for the reception. When that ceremony wrapped up, everyone came back to the Boatworks, and our reception for the train show ended up starting early. Luckily we had both art and historical society people bringing refreshments, so we had plenty to go around. One of my jobs was pushing the raffle tickets. I had my framed postcard print in the show, which had a sign promoting the raffle. That wasn't bringing in much business, so one of our trustees took it off the wall and carried it around. We took in more than $100 today, and with another week of the show, perhaps we'll make a little more. At 7:00 it was time to push everyone out the door and close up. However, I'll be back again tomorrow, putting in a shift at the Boatworks during the official Art Walk day, using the opportunity to promote some future woodcut classes, and myself in general. A week from today is the latest edition of the annual Belmar Art Walk, where artists will be set up all up and down Main Street, showing their wares and demonstrating their processes. 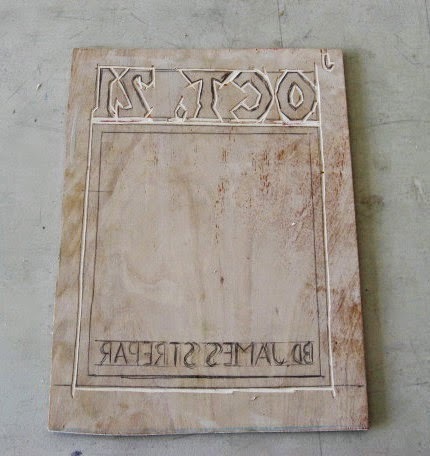 Last year I was stationed outside a yoga studio, cutting a new saint block. Although it was a nice day in general, my side of the street was in shade and there was a stiff breeze, so I got cold pretty quickly, and I was limited in what I could put out. This year I was offered a chance to do my demonstrating in the Boatworks, which will be much easier and more comfortable. Now I just need a print to be working on. When I need a piece for a demo and have nothing else in the works, my go to piece is another saint. As it turns out, I had plans for one, a St James for my nephew, to go along with the saint I made for his sister a few years ago. The main delay has been in picking one, as my book includes almost 30 St Jameses. But today I was at their house for Easter and spent a little time discussing the project with them, and a preference for a particular James was mentioned. That gives me several days to come up with a plan . Meanwhile, I cut a new piece of lauan to size a few days ago, and with the recent class I had been teaching, I have all my printmaking tote bags ready to go. Today is the first day of the Belmar and the Railroad show, but I had one last thing I was responsible for. I brought the two frames of historical stuff to the Boatworks a little before noon and put them up. Didn't take long- just tried them on the two hook wires already in place, adjusted the hook heights, coiled up the extra wire, a staple into each to hold the wire better to the wall, and then pictures on the hooks. The pair is shown above. That they are not level with each other is because that little section of wall is next to the ramp that connects the front and back rooms, so each is at the same height from the place where a viewer will stand in front of it. While I was still there Rebecca printed out the title cards we put by each piece, and we stuck them to the wall in the appropriate places. The only thing still missing is the big reproduction of the train station mural planned for the back wall, but that's delayed by a printer issue. At 1:00 pm we turned on the lights, put our the sandwich board sign and flag, and officially opened the show. Within 15 minutes we had our first visitors, and then more, and more. A total of 8 people while I was still there, a very good number for early on a weekday afternoon. At least one family group said it was because they saw the banner at the train station, It will be interesting to see how this plays out over the next few weeks. This morning a small team (me and two other volunteers) did most of the installing of the Belmar and the Railroad show. We ended up with about 35 pieces, not bad for a very specialized show and relatively short notice. However, there are still two empty areas. The big back wall (which last year held my Fourth of July series) will be used to show a computer printed image of the actual mural, at least as it exists now. And a short section of wall just outside the office will hold two things from the Belmar Historical Society. 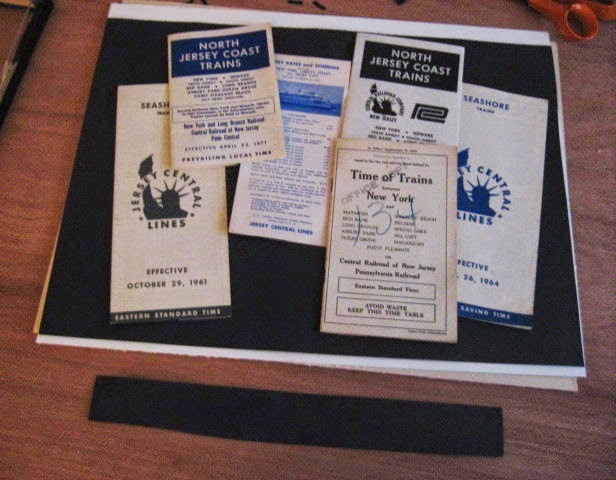 On Friday, I met with them and my contact gave me a handful of vintage rail schedules, going back as far as the 1930's. We have some frames leftover from a project last year, and it was suggested that I use them to show some of this stuff. An assortment of stuff in the frame was the idea, but with the condition that I couldn't tape or glue anything in place. After thinking about it for a few days, I got the idea to use strips of the same black construction paper I was given to back it, to make strips of paper that could be folded and wrapped around the back pages of the pamphlets, and then that could be glued to the backing, leaving the original documents untouched. I wouldn't go so far as to call it museum quality archival, but it will do for this brief show, and the schedules themselves are likely made from inexpensive paper with a bit of acid content. So I brought all this stuff with me to the Boatworks this morning, figuring I'd use the table space there to put this together, as well as frame a large photo of the somewhat decrepit Belmar train station as it looked in 1986. 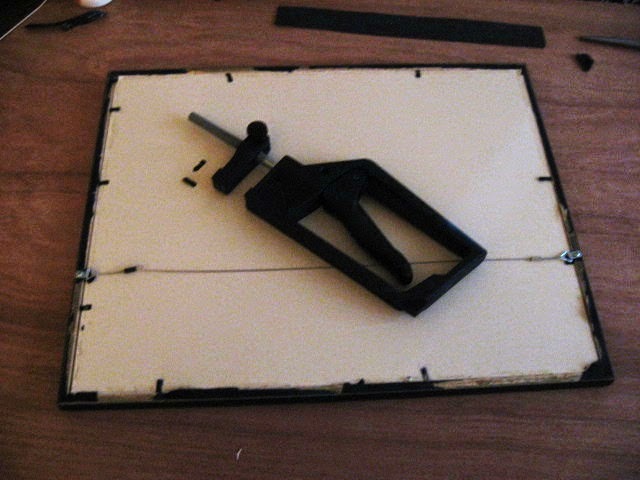 However, the frame shop that had produced the frames I was going ot reuse had glued paper to the back, and when I cut that off the first one I found the metal points used to hole the backing in place spontaneously falling our of the frame. No way to deal with that problem there, so I took it all home again. I've been mostly using metal kit frames for decades, but once in a while I need to do something in a wood frame and I do have the tools. Inserting these flat style points is easy enough with a point gun- a magnetized surface holds the points in place, and squeezing the handle drives it into the wood frame. So after the glue had dried on my assembled schedule collection (above), I put it all back together in the frame (below). The frame for the single photo was from the same event, but a much better employee must have done that one, because the points were in solid, so I could just bend them up, swap out the content, and then bend them back into place- no gun required. The building is closed tomorrow, so I'll take them over on Wednesday morning, which is the official opening day, and hang them on their reserved hooks. In the evening I went out to a kind of art function. Molly asked me to tell the critique group last week that this Monday she was beginning a series of art history themed lectures at the Spring Lake library, and invited us to come by, hinting that there may be opportunities for us there. I had never been there before. It's in a large brick building, which looks like it had been repurposed over the years. A somewhat convoluted path through rooms, doorways, and stairways finally led me to the upstairs room where Molly was holding her talk. A very large room, lots of architectural details, a mix of antique furniture, and a nice huge table in the middle, probably bigger than her whole house. Not surprisingly, it was a senior crowd, about 15 people. 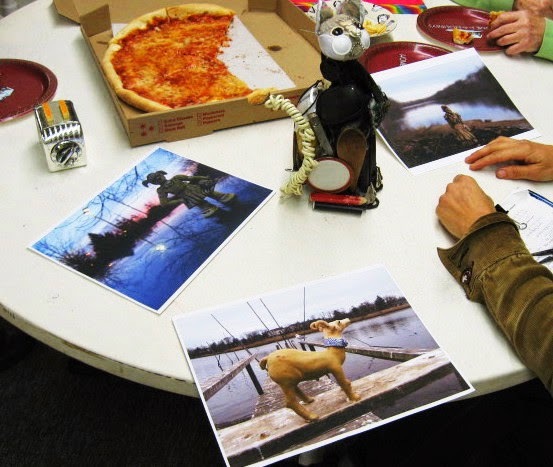 She did what she says she does to start her art history semesters, showing her own work to start a discussion about art in general, with dozens of examples of her work laid out. In the time before the event began she told me about some of the discussions she had with the library people, but I'll save those details until such time as they are closer to happening. 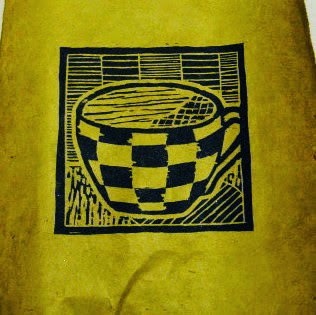 Today was the last session of my latest woodcut series in Belmar. We had five of the participants there, all working hard. My two most veteran woodcutters, Mary and Jill, were each working on projects of their own, and I just checked in on them from time to time. The three new students all came with finished blocks and in some cases ideas, so they kept me busy the whole time. Beverly hit me with a request as soon as she saw me, a new big piece of wood. She took this class to learn relief printing so she can print on fabric, to make pieces that she can use in her quilts and for other fabric projects. Today she showed me a piece of textured shiny cloth, shaped roughly like the side of a fish. Also a much larger fish paper pattern. 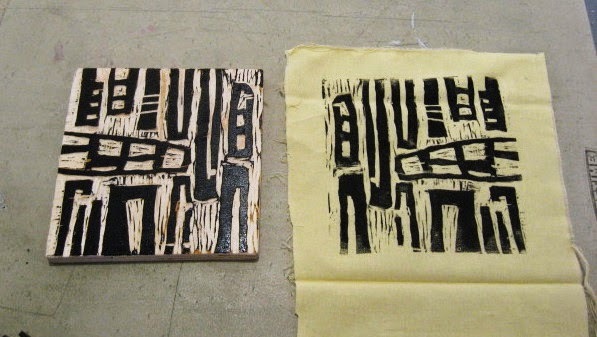 Her plan is to make a woodcut that will print onto a fabric construction that will include the fish cloth. So I cut her a large panel from my piece of birch, which she expects to work on over the next few months. Meanwhile, she wanted to see how her new finished block would work on cloth, so I helped her pull the above proof on a piece of plain cloth. She cut the block just as a random pattern, but printed as such she new sees it as resembling a tenement. Eventually this will be just one layer of the design. Denise has been working on this cup image since the 2nd week, and having picked up her own tools last week at the mural site, she had the block ready to print. I helped her pull a proof on our standard Rives paper, but then I suggested the image might look good on a more colorful paper. I had brought my rolled up assortment of more exotic papers today, and she selected some Nepalese paper, a color called olive in the catalog. The mix of green, gold, and brown worked nicely against the clean defined black shapes in her design. 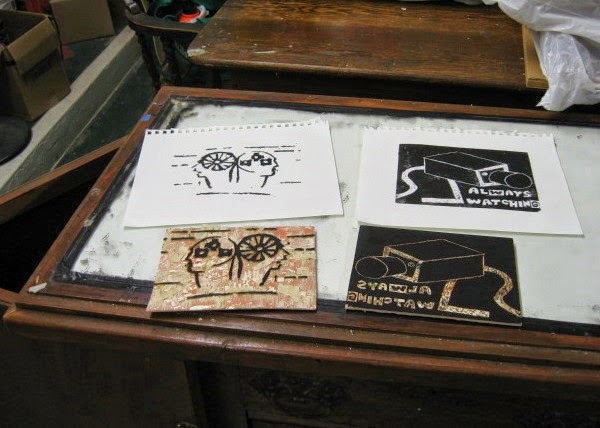 Palmyra had finished her first block in time to print it last week, and now had two more prints ready to go. She had already tried a proof of the one on the right on her own, but did some more cutting to the image before printing it again today on the Rives. 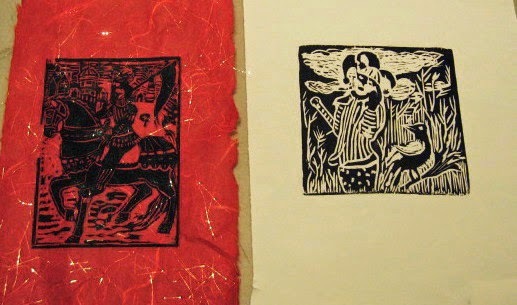 She also pulled one of the image on the left (the man on horse) on the Rives, but I felt that it would also look good on a color paper. I suggested this red mulberry paper with golden threads, and she was pleased with the result. So after four weeks all the new people are trained enough that they can cut and print blocks, assuming that they have the equipment and materials required. All had ideas that translated graphically, and I think they are excited to do more. So I'd say the class was a success. 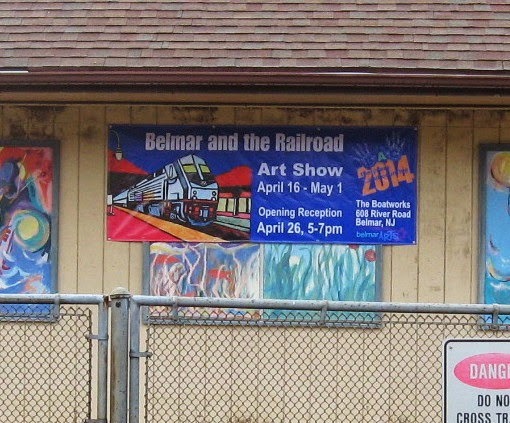 The railroad show at the Belmar Arts Council is almost up on the walls. Over the last week I've been working on some related tasks. For example, yesterday I had a meeting with some town people over their historical part of the show. I finished framing my original postcard print for display and to be used as raffle prize. And today was the intake of art for the show. Our latest digital age innovation is that we have all artwork submitted online in advance. 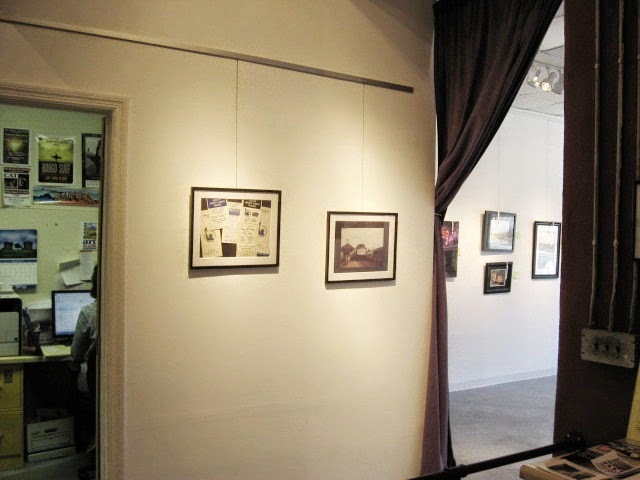 Instead of waiting to see what comes in the door, artists are required to fill our an online form with all the relevant information, including a photo of the work, even for shows that aren't juried. In this most recent case, it meant we could verify that the submitted pieces met the railroad theme requirement, and we did have to turn away at least one submission that didn't. So instead of artists having to spend time on this day filling out the forms, all the information is on our computer, and we have a print out of their entry. 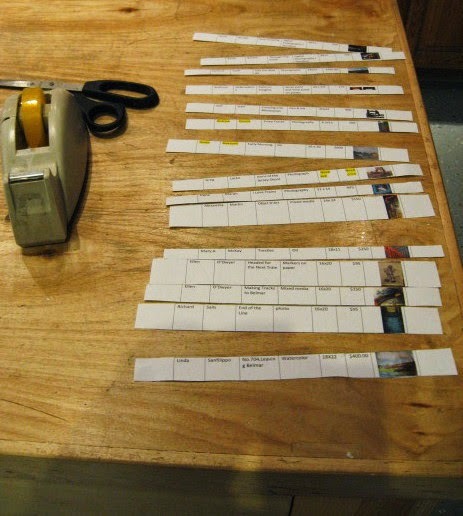 The significant information is cut into strips (above), each with a little thumbnail image of the work, and we attach these to the framed pieces as they come in. Very efficient. It looks like we'll have about 35 pieces in the show, which should fill the gallery spaces nicely. The actual hanging will start next week. Me, Print in My Studio? Seems like it would be a silly question, but it's been quite a while since I did any printing there. The only blocks that I've printed this year were my Christmas card and my train postcard, both done in my apartment. Each were small enough to do in my kitchen, and the combination of snow and sewage backup has kept me from using my printmaking space in 2014. Today I had two small blocks from late students in my 2D class, and with most of my printmaking supplies at home because of the Belmar class, I could have easily done them there. But I miss the Studio, and my table is as empty as it's been in a long time, and I wanted to get there early before tonight's critique to talk to the management, so I packed a bunch of stuff and went to Ocean Grove. Above are the two student blocks and prints. I had put out my e-mail reminders last week, but hadn't gotten any replies. Molly called in the afternoon to tell me she wasn't likely coming and to admit that she had forgotten to send out her usual text reminders, but she was offering to do it then if I wanted. I knew I'd be there anyway, so I had her do it. Around 6:45 pm our first participant showed up, and I had her go over to the cafeteria, which I had arranged for tonight's meeting. 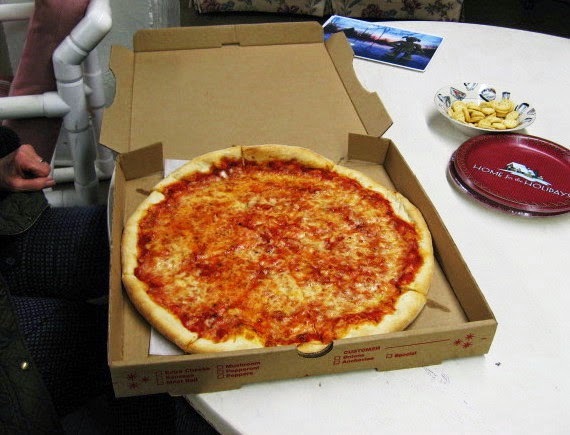 Two other regulars showed up, one of whom decided to bring us a pizza, so all those who skipped tonight- see what you missed? 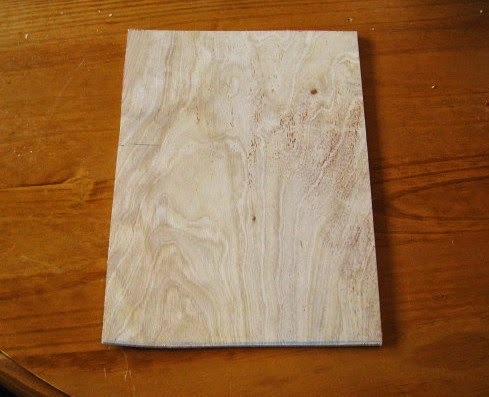 I had brought the tack board out to the cafeteria, but since no one had anything larger than 8x10, we just sat around one of the picnic tables (the dining furniture in the cafeteria) looking at art there. Above are photos from Margery (putting her ceramic sculptures in outdoor environments) and a found object cat from Lisa. Mary, who brought the pizza, had a couple of early proofs of some white line blocks she's experimenting with, but I didn't get a chance to photograph them. I put out the student prints since I didn't have any new work to show (they liked them) and showed photos from the weekend's mural installation. A little more relaxed than most of our meetings, but still a pleasant night. 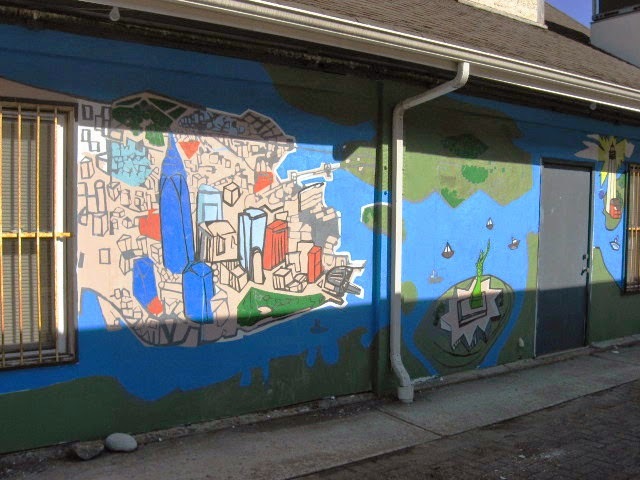 In the afternoon I went back to Belmar to continue work on the train station mural. I'm not much for early mornings if I can avoid them, but they had enough morning people to finish putting up the rest of painted cloth panels. When I got there, the effort had changed over to painting with brushes on walls, a mix of fixing issues with the design and covering all the transitional spaces over and around doors and windows with color. I was given a small pail of dull green, used for general vegetation, especially on the various islands around the images of New York Harbor. I worked on many of the green spaces in photo above, getting more than a little on my hands in the process. We knocked off around 4 pm again today, but this time we had color on the wall from end to end. There will be more datails to be painted in the coming days, but at least we have color blocked in everywhere. This wall should be a nice surprise for the Monday morning commuters, who last saw this building covered with plain white plywood. Weather was a bit nicer today. Not easy gluing 8 foot sections of painted cloth to the side of a building while 25 mph winds swirl around you constantly, but at least it was sunny and dry. I got there around noon to see a few panels already up, and I stuck around for about 4 hours to help with the process. Also had three of my current woodcut students show up to trade money for their new cutting tools, so they can continue working on their blocks before we have our next and last class meeting. Above is how things looked when we knocked off for the day around 4 pm. Work continues tomorrow. It's not done yet, but my mural now has some company there at the station. More photos from today's work can be seen over at the BAC blog. 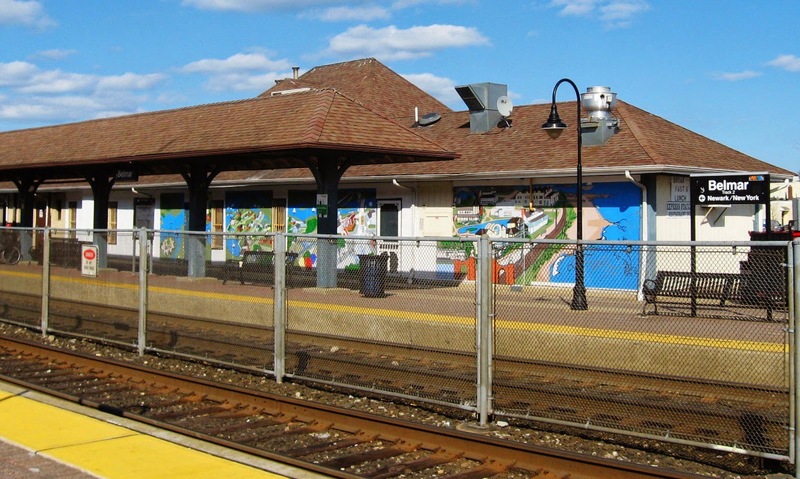 They tell us that spring is here, and the dedication of the new Belmar train station mural is scheduled for later this month. Of course that is dependent on the mural actually being on the wall. It's been painted on special cloth that will be adhered to the station wall, onto new wood panels that have been attached to the building. The muralist has been up in the area over the past week making preparations, and today was planned as the first day of the installation. As one of the town's established muralists, I was asked to help out and agreed to afternoon shifts today and tomorrow. Upon awaking today, I found a chilly, gray, damp day, but no actual rain falling. Walked to the store and back with no problems. Back home, checked my e-mails and found no messages of changes, so around mid day I headed to Belmar to start my first shift. I found the station to be as empty as I've ever seen it, no waiting passengers, and no muralists, who were scheduled to start hours before. Called the Boatworks and was told that they decided to postpone it because of the weather and the scheduled volunteers had been notified this morning. No word had found me. I couldn't leave right away, as I had told my woodcut students that I would be there if they wanted to stop by and pick up the woodcut tools they had ordered and I had finally received on Wednesday. Luckily I had the phone numbers with me and was able to reach them, and let them know I wouldn't be hanging around there much longer. We're hoping for better luck tomorrow with the mural installation. However, another train mural is there for now. The small structure (above) across the tracks from the platform where the new mural will be going has had some abstract pieces done by the BAC years ago. Hanging across those right now is a 10 foot banner, printed with a familiar design. The BAC has been producing these of late, typically hanging one on the outside of the Boatworks to promote the shows. An extra one was made for this show to hang at the train station, since there could be an overlap of interest from people in both locations, plus the official dedication will be during the time our show is on display. So even though my design wasn't chosen for the big permanent commission, for today anyway, there's one railroad themed mural at the train station, and it's mine.